Good until 4/7/15 or earlier if sold out, BuyDig is offering another Printer + Adobe bundle. This time you get the Canon MG6620 Wireless AiO printer + Photoshop & Premiere Elements 12 for $80 with free shipping when you use coupon code MGWIFI over there. BuyDig is offering the white Canon MG2520 All In One Inkjet Printer for $35 with free shipping. Offer ends by 3/15/15. Speaking of BuyDig, coupon DIG5 gets you $5 off an order of $99 or more at their Blowout Sale Savings. Coupon ends 3/31/15. At Staples stores and website, during the March 1-7 in 2015 shopping week, they will have a Buy 1 Get 1 Free promotion on Epson photo papers. No coupons, no rebates, the discount will be automatically applied by the cash register. The B1G1 is on the same SKU, so you have to buy them Noah’s Ark style (in multiples of two). PS: Staples no longer runs the free after rebate photo paper specials (HP, Kodak, Staples house brand) they used to run in previous years. BuyDig is offering a bundle of the Canon PIXMA MG2520 All-in-One Printer Bundle + Adobe Photoshop Elements 12 for $55 with free shipping. The price drops from $147 to $55 after you add it to the shopping cart. No coupon code needed. No login needed to check the price. Offer ends 2/27/15. Speaking of BuyDig, coupon DIG5 gets you $5 off an order of $99 or more from their Blowout Sale. Coupon ends 2/28/15 unless extended. A Do-It-All-Paul printer, the Epson Workforce WF-2540 inkjet all-in-one (print, copy, scan, fax) is currently on sale for $60 at the Staples website as part of their featured online offers. There are multiple delivery options, including store pickup (if in-stock locally), free ship-to-store, or free shipping (for Staples Rewards members). Offer ends by 12/27/14. Note this is an older-ish model, so only 10/100 Wired Ethernet and only 802.11 b/g/n wireless. This Black Friday deal has more Staying Power than Tony Bennett, Diana Ross, Leonard Cohen and Aretha Franklin combined! You can get as a bundle together the Adobe Lightroom 5 software plus the Canon MG5520 printer at BuyDig.com. No coupon needed. To see the $80 price, you have to add it to the shopping cart (no account sign-up needed; just add to cart). The price before adding to cart is $150. Limit one per customer during the promotional period. Would you like a printer with your Lightroom? 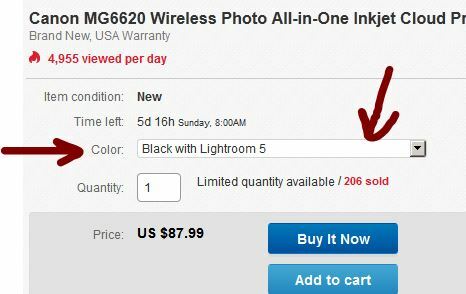 🙂 BuyDig has a new combination promotion, the price of the Lightroom 5 and Canon PIXMA MG5520 Wireless Inkjet Photo AiO Printer Combo drops to $80 with free shipping when you add it to the shopping cart there. There price before the add-to-cart is $150. No coupon needed. Limit one per customer. Expires 11/30/14 or earlier if sold out. This daily deal expired… The headliner deal of the day for Monday 11/10/14 at the Best Buy website is the Epson Expression Premium XP-610 printer offered for $75 with free shipping. Or for $88 with free shipping they offer a bundle with extra black ink (Epson 273 T273020). This ships online and it may also be available for store-pickup (you can check by zipcode over there). Promotion ends on 10/31/14 at 11:59pm ET. On the do-it-all-Paul all-in-one double-figures printers front, the Epson Workforce WF-2540 is currently on sale for $80 with free shipping at Best Buy and Amazon by Amazon herself.